After two days of playing with grandsons, I was ready to get back to my loop antenna project. 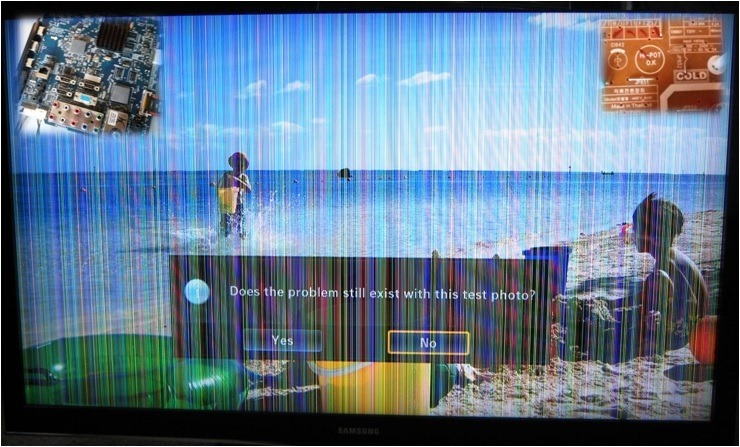 Then, my wife’s TV died! As my brother-in-law Willi says: “happy wife, happy life”. So it was time to fix or replace the television. We have a six year old 46” Samsung television in the bedroom. It is model LN46C650 purchased from, where else … Costco. For a couple of years, we have an intermittent problem with vertical lines showing up on the picture. Giving the HDMI cable a few wiggles seems to solve this, at least until the next time the TV gets turned on. Then, it’s time for more wiggling. But this week, a second problem arose. The Samsung picture would start flashing like a strobe light. Turning the set off for ten minutes would resolve this temporarily. But then it would start flashing again. Finally, the flashing was almost continuous. You can see an example of the flashing in this video. My TV has two main circuit boards. One is the power board, shown top-right above. The other is called a T-CON or timing control board, shown top-left. The intermittent vertical lines problem is a timing control problem. It is probably caused by a bad solder connection on the T-CON board. Since the HDMI connectors are soldered to the T-CON board, wiggling the HDMI connector also wiggles the timing control board, somehow resolving the problem. But how about the strobe flashing? With a few Google searches, I came up with a solution to the strobe flashing on one of my favorite DIY web sites Instructables. The author discovered that the solution recommended by Samsung was to cut a certain jumper wire on the power supply. He provided detailed instructions (of course) on how to perform this Samsung TV DIY Repair. The hardest part was removing the back cover and stand. After that, it was just a case of finding the clearly marked jumper and snipping it with wire cutters. Since I had the back off the television, I then turned my attention to the T-CON board, which was also exposed. It was clear that the HDMI-1 connection was very loose on the circuit board. I will not use it anymore, as I also have HDMI 2 through 4 available. Also, I carefully made sure all of the cables attached to the timing control board were properly seated, and that the board was tightly screwed down. The TV has been back in service for a while, now, and both problems have been cleared. In fact, it looks as good as new. How well and for how long this Samsung TV DIY repair holds up, I have no idea. So far, so good. Replacing this set would have cost $700, so for now, that’s money in the bank.